Long gone are the days when the wrinkles on your forehead were restricted to old age. Today, forehead wrinkles or frown lines are easily seen even at younger age. The forehead wrinkles may look pretty on a pug but it is not the same with humans. In fact, forehead wrinkles not just make you look aged but are also a clear reflection of the dark, gloomy, depressive and stressful life you are leading. Everything has a time and so, if you would have developed forehead wrinkles after you entered old age, maybe you would not have mind that much as it is a part of the natural aging process. But if these old age symptoms start occurring early in your life, then, it can be really frustrating. But, the good news is that forehead wrinkles can be treated and there are natural ways to get rid of forehead wrinkles. 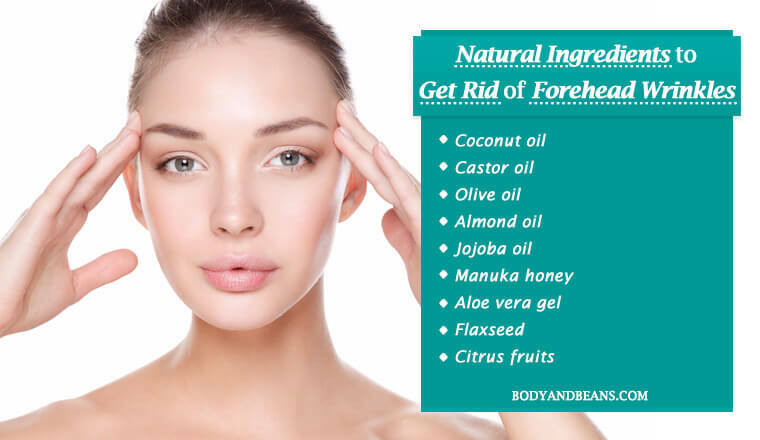 And if you are wondering about how to get rid of forehead wrinkles, then you will be glad to know that there are ways to get rid of forehead wrinkles with the help of natural ingredients. If you can use these remedies properly then you will be able to get rid of forehead wrinkles easily at home. Be it due to the excess level of stress both in personal and professional life, or too much of exhaustion due to the hectic lifestyle or exposure to pollution, toxic chemicals and ultraviolet sun rays or may be due to some underlying diseases, many of us get aged skin symptoms like forehead wrinkles quite early in life. Surely, it is not pleasant and has negative impacts on your mental health too. After all, who wants to look in his/her 50’s when he/she is in his/her 30’s. But, you know what, there is no need to lament on what happened as that will not bring out any positive outcome. Instead the very thought of you looking aged early will make you more depressed, which in turn is going to reflect on your face. So, you need to act and find out ways to get rid of forehead wrinkle problem and for that, you got to try some of the remedies that we are discussing right here in this post. Nature has gifted us with many ingredients that can be used to our advantage. You just have to explore a little bit and find out more about the health and beauty benefits of these ingredients. And, as far as the natural remedies that I will be sharing on how to get rid of forehead wrinkles are concerned, these remedies will not just reduce the forehead wrinkles, but it will also help in enhancing the overall health of your skin. It will also remove the other aging signs like fine lines, dark circles etc. and will reward you with a glowing youthful skin that you desire to have. Moreover, these remedies are not just meant for the young individuals with forehead wrinkles but also for those who are at the brink of entering old age. This is because if you use them from the beginning, it might help you delay the aging process and help you maintain your youthful charm a little longer. So are you ready to explore the remedies to get rid of forehead wrinkles? I guess you are, so let’s just dive in. One of the best ways to get rid of forehead wrinkles (frown lines) is by using the coconut oil remedy. The reason why it is so effective is because it is the perfect moisturizer that your skin requires to stay healthy. Moreover, coconut oil is filled with antioxidants that helps get rid of the free radicals that otherwise accumulate in the skin making it dull and full of wrinkles. Coconut oil eliminates them and fades the frown lines effectively in due course of time. How to use – The procedure to use coconut oil remedy to get rid of forehead wrinkles is very simple. All you need to do is to take some organic coconut oil and massage it on your forehead for a few minutes. You can also leave it to get naturally absorbed by your skin. If you repeat it every night before going to bed, then you will be able to get rid of forehead wrinkles within few weeks. Egg white on the other hand, besides being rich in Vitamin E is responsible for toning and tightening sagging skin and thereby helping you regain the lost charm. 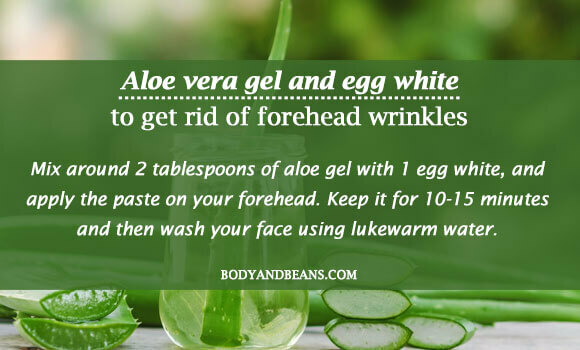 How to use – If you are ok with using egg white along with the aloe vera gel, mix around 2 tablespoons of aloe gel with 1 egg white, and apply the paste on your forehead. Keep it for 10-15 minutes and then wash your face using lukewarm water. Do this on a regular basis unless you get the desired results. If you want to avoid egg white, then you may just dab a bit of aloe vera gel on your forehead and face and let it stay overnight. The richness of omega 3 fatty acids and several other nutrients in flaxseed oil makes it extremely healthy for your skin and you can use it to get rid of forehead wrinkles as well. It is also filled with several antioxidants that helps fight the free radicals leading to frown lines. When you ingest flaxseed oil, it leads to the lubrication of your skin and makes the outer layers plumped up which in turn, helps to fade away the appearance of the wrinkles and the fine lines. 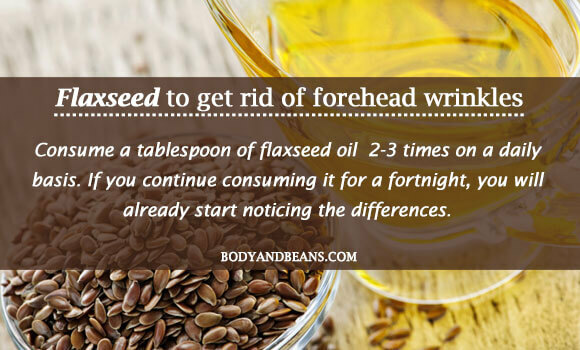 How to use – In case of flaxseed oil, I will recommend you to consume a tablespoon of it 2-3 times on a daily basis. If you continue consuming it for a fortnight, you will already start noticing the differences. 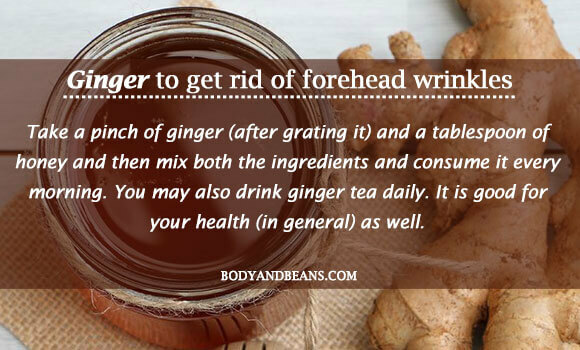 Ginger is a commonly available ingredient in our home and so you will be surprised to know that you can use ginger to get rid of forehead wrinkles. The primary reason why it is so effective in dealing with forehead wrinkles is because it possesses antioxidant properties which help in getting rid of the skin damaging free radicals. Also, ginger helps in the prevention of the breakdown of elastin in the skin that in turn inhibits the appearance of the wrinkles that has resulted from excessive exposure to the sun. How to use – For maximum skin benefits, you just have to take a pinch of ginger (after grating it) and a tablespoon of honey and then mix both the ingredients and consume it every morning. You may also drink ginger tea daily. It is good for your health (in general) as well. 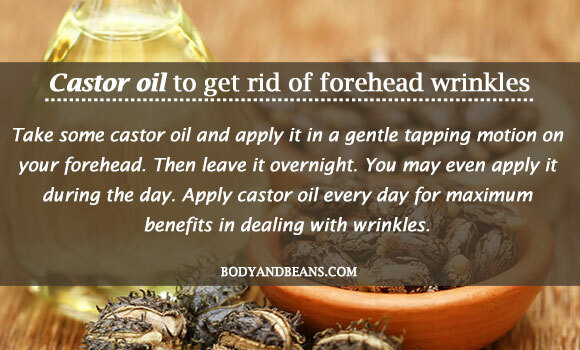 If you thought that castor oil was just meant for promoting hair growth, then you are wrong as you can use castor oil to get rid of forehead wrinkles as well. Surprised? Don’t be surprised. Because castor oil is a great skin-conditioning agent, thanks to the presence of ricinoleic acid in it. It also contains antioxidants that helps fight the free radicals and keeps your skin healthy and glowing in general. How to use – Take some castor oil and apply it in a gentle tapping motion on your forehead. Then leave it overnight. You may even apply it during the day. Apply castor oil every day for maximum benefits in dealing with wrinkles. 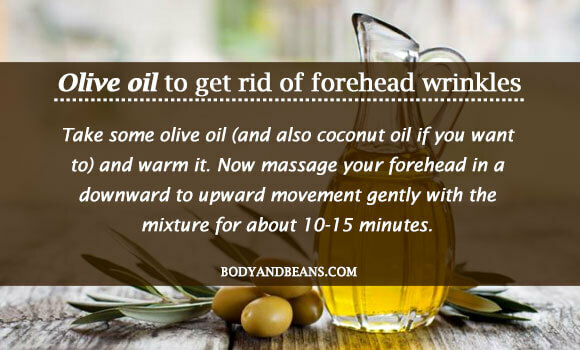 Massaging your forehead with olive oil is one of the best ways to get rid of forehead wrinkles (frown lines) naturally at home. This is because it helps in the proper circulation of blood to the facial tissues. It also keeps the facial muscles relaxed and stress free that is also helpful in avoiding the occurrence of forehead wrinkles. However, it is best if you can also use coconut oil along with olive oil because then it will help to moisturize and hydrate your skin that will further benefit in making your skin healthy and glowing. How to use – Take some olive oil (and also coconut oil if you want to) and warm it. Now massage your forehead in a downward to upward movement gently with the mixture for about 10-15 minutes. 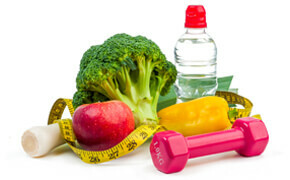 If you repeat the remedy two times on a daily basis, then you will start noticing the improvements within few days. Almond oil is another oil which is highly beneficial in removing forehead wrinkles. It is also very useful in keeping your skin smooth and rejuvenated. Also, it possesses emollient properties that moisturizes and nourishes your skin. In short, usage of almond oil fades away the forehead wrinkles at the same time is healthy for the general well being of your skin. 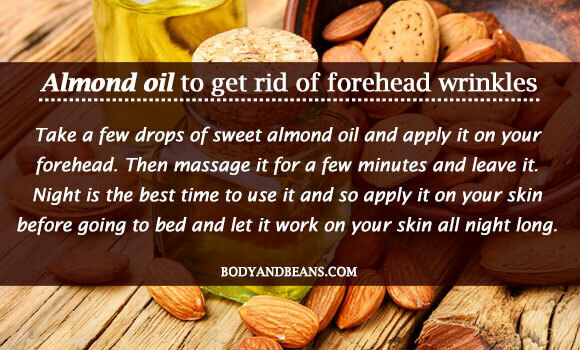 How to use – Take a few drops of sweet almond oil and apply it on your forehead. Then massage it for a few minutes and leave it. Night is the best time to use it and so apply it on your skin before going to bed and let it work on your skin all night long. 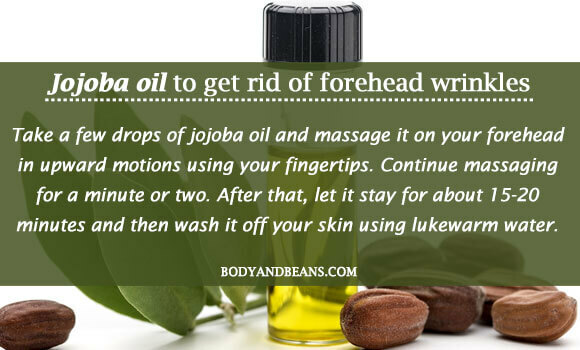 The next remedy that you can use to get rid of your forehead wrinkles is jojoba oil. The reason why it is so effective in this case is because of the presence of high amount of Vitamin E that is very beneficial for your skin. In addition to it, jojoba oil contains ester that is very portent in slowing down the aging process of your skin. How to use – Take a few drops of jojoba oil and massage it on your forehead in upward motions using your fingertips. Continue massaging for a minute or two. After that, let it stay for about 15-20 minutes and then wash it off your skin using lukewarm water. When you apply this remedy every night before going to sleep, then it will be very effective in dealing with forehead wrinkles. One of the best ways to get rid of forehead wrinkles is by using the perfect alternative medicine that is manuka honey. The primary reason why this honey is so effective in dealing with forehead wrinkle is because of the antioxidants like benzoic acid and methylglyoxal present in it that imparts it with therapeutic potential to get rid of the forehead wrinkles or frown lines. It also helps in keeping your skin rejuvenated, youthful and healthy. How to use – Here you need around 1-2 tablespoons of honey, a washcloth and some hot water. At first, you got to soak the cloth in the hot water. Then wring the cloth to get rid of the excess water. After that, place it on your forehead for about 1-2 minutes. This will help in opening of your pores. 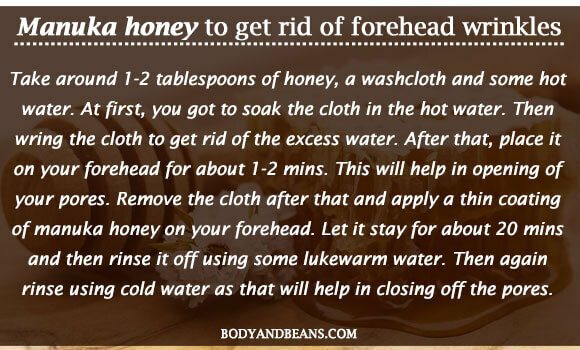 Remove the cloth after that and apply a thin coating of manuka honey on your forehead. Let it stay for about 20 minutes and then rinse it off using some lukewarm water. Then again rinse using cold water as that will help in closing off the pores. Repeat the remedy on a regular basis for maximum benefits in dealing with forehead wrinkles. 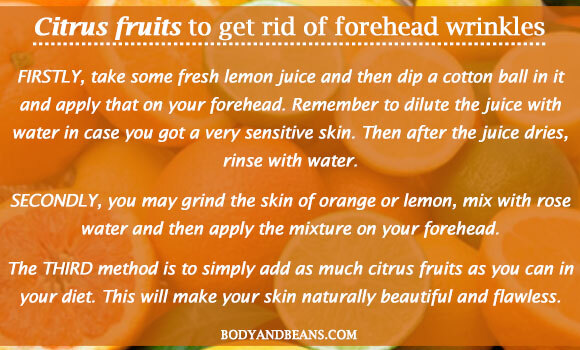 You can use citrus fruits like lemon and orange to get rid of forehead wrinkles naturally. This is because the citrus fruits are rich in Vitamin C and E that are great for your skin. In fact, they are just perfect to maintain the smooth texture of your skin. Also, the flavonoids present in them help in strengthening of the capillaries and maintain the elastin and collagen in the skin that in turn will help you to maintain your youthful radiance for long. How to use – Well, there are several ways to use citrus fruits to remove forehead wrinkles. I am going to tell you 3 of them which I feel will help you the most. Firstly, take some fresh lemon juice and then dip a cotton ball in it and apply that on your forehead. Remember to dilute the juice with water in case you got a very sensitive skin. Then after the juice dries, rinse with water. Secondly, you may grind the skin of orange or lemon, mix with rose water and then apply the mixture on your forehead. The third method is to simply add as much citrus fruits as you can in your diet. This will make your skin naturally beautiful and flawless. Well, petroleum jelly cannot be considered to be a truly “natural” remedy for forehead wrinkles as it is after all a commercial product. But undoubtedly, it is one of the most trusted and commonly used commercial products and fortunately, it is safe. So, we can consider using it as one of the remedies to get rid of forehead wrinkles. Petroleum jelly is extremely beneficial for your skin especially if yours is a dry skin. It hydrates your skin and helps in the prevention of frown lines. However, if you have got a very acne-prone skin, then I would recommend that you avoid the remedy because it may aggravate the acne problem. Well, for the rest, I hope it will just be very beneficial. How to use – Take some petroleum jelly and then after dampening your skin lightly, apply a tiny amount of the jelly on your forehead. Then massage your skin so that it does not feel too sticky. 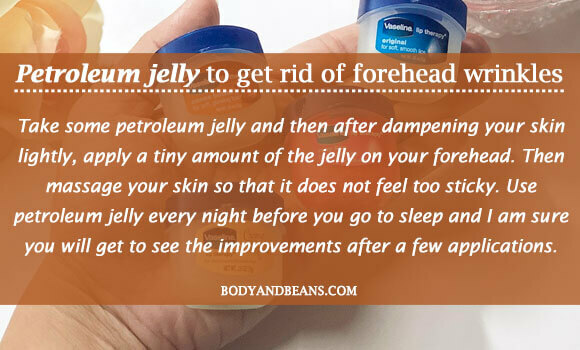 Use petroleum jelly every night before you go to sleep and I am sure you will get to see the improvements after a few applications. Which is your favorite way to get rid of forehead wrinkles? Having forehead wrinkles quite early in life is not at all pleasing. It makes you look older than your actual age and that’s definitely a very unwelcoming thing. I mean your face is the reflection of your heart, so if you are not happy from inside, it is bound to be reflected on your face. Now, as far as the problems in your life go, I have no control over it. The only thing I can suggest is to try and keep yourself stress free as much as possible. But, as far as your issue of forehead wrinkles or frown lines is concerned, there are easy ways to get rid of it. I have already discussed about a few of the most effective ways to get rid of forehead wrinkles (frown lines) naturally. If you implement these remedies properly, it will surely help you get rid of forehead wrinkles fast. I have also explained the steps and so, I hope if you follow the instructions well, you will be able to see the remarkable difference in the signs of wrinkles on your forehead. Moreover, the natural remedies I suggested are extremely cost effective and the ingredients mentioned may be easily available in your kitchen or in the market. Of course, you do not have to use all of these remedy, rather you can try a few of them and see how it works and suits your skin. Just choose your favorite one and see how it works for you. Or, you may give each one a try and see which remedy you are most comfortable with. The choice is completely yours. However, do not forget to share the feedbacks and suggestions. I will be waiting to hear your experience. 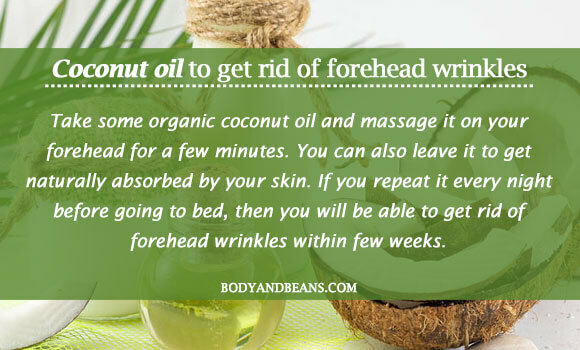 Also, if you know any other natural ways to deal with forehead wrinkles, then feel free to share with us. And, in case you like my posts, please do comment and share it with others and let the word spread among all. Until then, stay happy, stay beautiful.